A NEW Zealand charity auction winner will be able to ride out the Marmageddon in ostentatious style after bidding NZD$2115 for a massive 25kg bucket of the yeasty spread. The motherlode of Marmite and a 175g jar of the spread picked up the outlandish sum in a Trade Me auction listed by Gilmours Hamilton that closed this afternoon. Hundreds of listings for jars of the spread, some already used, have cropped up on the site since Sanitarium last week announced a shortage that has seen stores sell out throughout the country. Gilmours Hamilton owner-operator Rick Donaldson told APNZ the idea for the charity auction came about when staff at the wholesaler were sitting around the lunchroom table and having a bit of a laugh at "the crazy prices" people were asking for Marmite. "I said 'I wish we had some' and one of the girls said, 'Oh, we've still got that 25kg bucket downstairs'." Mr Donaldson's wife suggested they auction it off for charity and the listing quickly gained attention, with almost 153,000 people checking out the auction and dozens commenting on it. Despite the huge interest, Mr Donaldson was surprised at the winning bid. "It was sitting on NZD$860 for a while and I thought, well we've got a chance of it going over NZD$1000. And all it it takes is two people to want it, and the way it went is just fantastic." There was even interest from far afield, with one potential bidder asking what the postage to Dubai would cost. "Hopefully they didn't win - I might have to go over there and take it over there personally. It's got to go first class." Mr Donaldson had not yet heard from the winning bidder, who gets to choose which charity the auction proceeds will go to. But he was certain they would not try to profit from the huge haul of Marmite. "It wouldn't surprise me if the winning bidder donates it to someone, to an organisation that would be deserving of it." Gilmours Hamilton had sold out of Marmite early on and Mr Donaldson said the amount of passion about the spread was "just amazing". "Sanitarium are probably surprised at just the response they've had with regards to running out of it," he said. 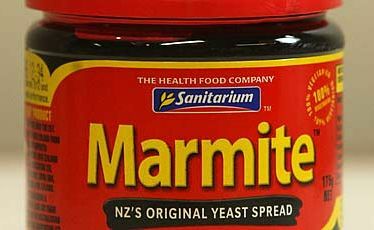 Manufacturing of the popular breakfast spread was halted by earthquake damage to Sanitarium's Christchurch plant - the only plant where Marmite is made. Sanitarium has been working to relocate its manufacturing facilities to a safer part of the site, with the aim of getting the spread back on shelves by July. It has asked consumers to ration their Marmite use while supplies were spread thin.